After finishing the 2014 season with a 4-12 record, team owner Woody Johnson relieved coach Rex Ryan of his coaching duties after six seasons. On January 14, 2015, former NFL defensive back, Todd Bowles was hired to be the Jets head coach sparking what has been a productive offseason for the New York Jets. Bowles has been one of the hottest names on the NFL head coaching market over the last few years. He enjoyed an eight-year NFL career as an undrafted rookie out of Temple in 1986. By 1997, Bowles began his coaching career as the defensive coordinator at Morehouse College. He moved on the next year to become defensive coordinator at Grambling State before joining the Jets as their secondary coach in 2000. 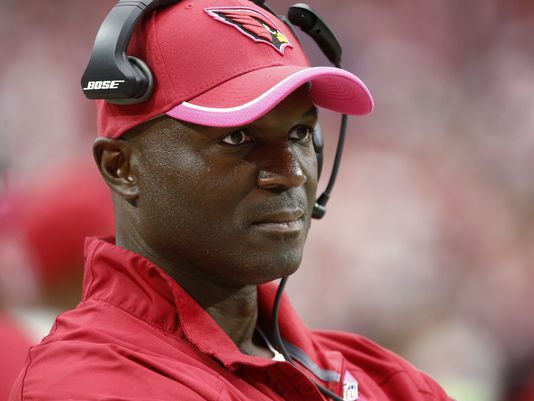 Since then, Bowles has coached for five other NFL teams in roles such as secondary coach, assistant head coach, interim head coach, and most recently as the defensive coordinator with the Arizona Cardinals the last two seasons. Bowles is known as a player’s coach and gains instant credibility as a former player, successful coordinator, and a Super Bowl winner with Green Bay in 1996 as a member of the personnel staff. He has surrounded himself with a talented staff including former NFL and college head coach Chain Gailey as offensive coordinator, Kacy Rodgers as defensive coordinator, and Bobby April, Jr. as special teams coach. Look for Bowles to create a culture of mutual respect where his players work hard in practice as well as games. As the team focuses on the 2015 season, they have already made some strong player decisions. Cornerback Curtis Brown and defensive end Ronald Talley were signed as free agents currently without contracts from any NFL team. With Bowles’ strong defensive background, the team decided to exercise the contract options on linebackers Calvin Pace and Justin Babin. One player not returning after only one season with the team is running back Chris Johnson. Once considered one of the top backs in the league due to his breakaway speed, Johnson continued his downward spiral that prompted the Tennessee Titans to let him walk in free agency. Johnson has lost a step and has had trouble finding holes to break through. With Johnson gone, there is no need to panic. Former New Orleans Saint Chris Ivory came to the Jets via trade in 2013 and has rushed for over 800 yards each season on less than 200 carries per year. With Johnson gone, look for Ivory to be the featured back and rush for over 1200 yards. Last season, he broke off for a 71 yard touchdown scamper which is second in team history. Today has been the biggest day for the Jets this offseason. Linebacker David Harris, the team’s leading tackler, has signed on to lead the defense for another three seasons. The team also traded for enigmatic Pro Bowl receiver Brandon Marshall giving up only a fifth round pick to get him. The trade will not be official until March 10 at when the new league year begins. Marshall, 30, has made the Pro Bowl in five of his nine seasons in the NFL. The Jets are his fourth team as he was drafted by the Broncos before being traded to Miami. After two years in Miami, Marshall was traded to the Chicago Bears in 2012 where he remained until today. In 2011, Marshall expressed publicly he suffers from Borderline Personality Disorder. While he is on medication, Marshall is not without faults and still has issues with anger including this season where he threatened to fight a Detroit Lions’ fan on Twitter. Bowles knows what baggage Marshall brings as the two of them were with the Miami Dolphins for the 2010 and 2011 seasons. The Bears are not getting rid of Marshall because he hasn’t been productive. Marshall’s $7.5 million base salary would have become fully guaranteed on March 12 and the Bears need to use that money to upgrade many facets of their team. Nobody has ever questioned Marshall’s ability on the football field. He has five seasons of over 100 receptions and owns the NFL record of 21 receptions in a single game. Marshall did not reach 1,000 yards receiving last year as he had the previous seven seasons due to being placed on injured reserve with a punctured lung and fractured ribs. If I were to compare Marshall to a receiver from the past it would be Michael Irvin. Like Irvin, Marshall is a physical receiver who can use his body to ward off defenders and make the catch. Both players have sacrificed their body to make a tough catch across the middle or to move the chains. Once Marshall passes his physical, the Jets will have revamped their receiving corps over the last two years. They signed wide receiver Eric Decker away from Denver last offseason and also drafted tight end Jace Amaro. Rumor has it Percy Harvin will be cut in a salary cap move, but Jeremy Kerley is a capable third receiver. The “X” factor for the Jets will be the quarterback position. 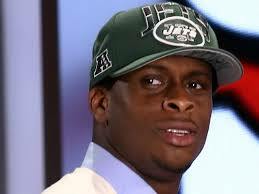 Geno Smith is entering his third season in the league and has thrown 25 touchdowns. However, Smith needs to hold onto the football as he fumbles often and has thrown 34 interceptions as a pro. Matt Sims, son of former New York Giants’ quarterback Phil Simms, signed a one-year contract in December 2014 to stay with the Jets. Veteran Michael Vick is a free agent and it appears the Jets will let him test free agency. At the most, I do not see Vick returning to the team as anything more than a backup. Like any new coach coming in, Bowles may want to bring in his own quarterback. I strongly believe the Jets will try to draft either Jameis Winston from Florida St. or Oregon’s Marcus Mariota with their first round pick. Another possibility might be trading the number 6 pick to the Philadelphia Eagles for their pick and Nick Foles if Mariota is still available at 6 to be reunited with Eagles’ coach Chip Kelly. With almost $46 million available to spend via free agency, Bowles can upgrade his defensive line and cornerback position. Corner Antonio Cromartie has discussed possibly returning to the Jets. If not, the top two options are Byron Maxwell from the Seattle Seahawks or Brandon Flowers from the San Diego Chargers. The interior part of the d-line can be upgraded by signing Ndamukong Suh or Nick Fairley from the Detroit Lions. Without even knowing what the Jets will do in the draft or free agency, I look for them to improve 3-4 wins next year with a return trip to the playoffs in year two of the Todd Bowles’ era. And that’s…as I see it!